Egg: Laid in cells within the paper nest. Larvae: Legless larvae which are fed by drones, develop within 4 weeks. Pupae: Develop within 2 weeks within the cell. Adult (Queen): The queen will overwinter for up to 6months, she will then emerge in mid-April an begin to create a nest. A single Queen will tend to only one nest for one season, perishing before the drones leading to the collapse of the nest and dispersal of the next generation of Queens. 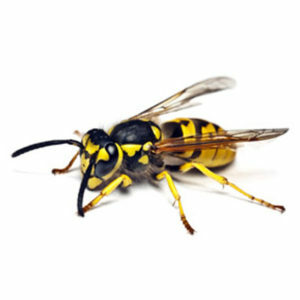 Adult wasps are 10-20mm long with a distinctive yellow and black patterning all over their bodies. They have two pairs of wings which are hooked together to give the impression of a single pair of wings. They are a social insect creating ‘paper’ nests of regurgitated wood pulp. Nests are maintained by sterile workers led by a single Queen. Common throughout Britain and Northern Europe, favouring sites which are enclosed. Favourable nest sites may include soil banks, cavities in trees or walls and roof spaces. Wasps become a nuisance towards the end of summer when the Queen perishes. The death of the Queen wasp halts the production of eggs and subsequently this reduces the larvae which provide the workers primary food source. 1. The British Pest Management Manual. Section 5, pg 65. 2. ‘Pest Animals in Buildings, a world review’. Norman Hickin pg 153.